When she wrote the acknowledgments of her dissertation, Roselyn B. Boneno used the words of poet Walt Whitman to exemplify the task of writing, citing from "A Noiseless Patient Spider": "Ceaselessly...venturing ...the spheres to connect them;/Till the bridge you will need be form'd...."
Such words also describe Boneno's life. The common thread that forms the bridge, as Whitman's reference implies, is education—education not only for herself, but also as a means of inspiring this love for learning in all who have come under her tutelage. She frequently makes reference to the lack of high quality education as the core of the problems plaguing the state. Education is the ultimate advantage for any individual in Boneno's estimation, and she credits her maternal grandparents, parents, and secondary school teachers as her primary motivators. From them, she learned that nothing is impossible and that no goal is out of reach if one has the desire and the education. When it comes to understanding the value of education, Boneno has put in her time. 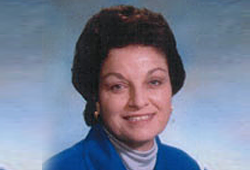 As a member of a Catholic order of religious women, the Marianites of Holy Cross, Boneno began her career as a teacher. Initially she obtained an undergraduate degree from Our Lady of Holy Cross College in New Orleans and subsequently earned a Master of Arts degree from St. Mary's University in San Antonio, Texas. Motivated by both a thirst for knowledge and a desire to teach at the university level, she began doctoral studies at LSU. She selected LSU, she says, "primarily because of its excellent history faculty and also because it provided the opportunity to continue working as a secondary school administrator." To accomplish her goal and to avoid placing a financial burden on her religious community, Boneno sought and obtained a Governor's Board of Supervisors Scholarship through the generosity of board member Murphy J. Foster. She also received an assistantship in the LSU Department of History after she had completed course work for her degree. In 1986, she was awarded a Ph.D. from LSU. She had chosen as her dissertation title "A Study of Italian Immigrants in New Orleans, 1880-1910." The subject was inspired by her maternal grandparents, Antonio and Eleanora Bologna, who were first generation immigrants to the United States. Whitman's "venturing" took another path when she decided to leave the religious community that she had been so proud to serve to pursue another career. As she was completing her dissertation, Boneno took a position that provided her the chance to become acquainted with the insurance industry. Of that moment in her life, Boneno recalls, "This part time work presented yet another opportunity—the need to earn an insurance license." Also, at around the same time in the early 1980s, State Farm Insurance Company began hiring female college graduates as agents in Louisiana. Although the classroom was her first love, the opportunity to own her own business as one of the first women agents hired in Louisiana presented another avenue, albeit in a different direction. Boneno feels that this change in careers did not diminish her role as a teacher. Education was still part of her life, though this time it was in educating clients to understand the sometimes complicated scenarios before them. Never was this more evident than in 2005 when Hurricanes Katrina and Rita wreaked havoc on the Gulf Coast, New Orleans, and most of South Louisiana. Katrina destroyed Boneno's office in New Orleans, forcing her to relocate to the suburbs. Although heartbroken over the destruction of her beloved city, she continued her work using her education and insurance experience not only to handle claims, but also to comfort and console those who lost everything in the storm. Today Boneno is retired and living in Baton Rouge. She continues part time work, assisting a local State Farm agent. The remainder of her time is spent working with organizations aimed at improving life in New Orleans, Baton Rouge, and the LSU communities. She is a member of her neighborhood homeowners association, takes continuing education courses, and indulges her love for music through her support of the New Orleans and Baton Rouge symphonies. In addition to all these activities, she makes time to serve as the chair of the Dean's Advisory Council of the LSU College of Humanities and Social Sciences. Since earning her doctorate, Boneno has been an invaluable supporter of the LSU Department of History, the College of Humanities and Social Sciences, and the university as a whole. In 2004, she established the Roselyn B. Boneno Award for Distinguished Undergraduate Teaching in History, an award that encourages and rewards history faculty members who exhibit excellence in the classroom. Most recently, she pledged a significant portion of her estate as a planned gift to the university to establish the Roselyn Bologna Boneno Professorship in American History. When asked about the motivation behind her gifts to the university, Boneno makes it clear that she considers what she has done to be more a responsibility than an option: "From as long as I can remember, there existed the idea that whatever success one achieves, with that came the obligation to assist others. I just hope that more people will come to understand just how much LSU needs every one of us to contribute to the university's success by whatever means possible." Both of Boneno's major gifts to the university—the teaching award and the professorship—reflect her passion for learning. In fact, one might even say that LSU is simply a conduit through which she hopes to achieve her ultimate goal: Improving education in Louisiana. She considers this enormous task to be her response to Whitman's call, ceaselessly venturing (educating) till the bridge (to success) is formed.